The U.S. Air Force is expected to decide by the end of this year whether it will put F-35 fighter jets at Burlington International Airport, but cities in Chittenden County, citing environmental concerns, are already reaching conclusions about whether they even want to support the military program. Their decisions could affect the Air Force’s preferred location for the new jets. South Burlington’s City Council voted this week to oppose the plan that would bring new fighter jets to Burlington International. Rosanne Greco, chair of South Burlington’s City Council, says the city has been taking the time over the past few weeks to review the Pentagon’s Environmental Impact Statement. "If you read the various categories in the Environmental Impact Statement that the Air Force produced, you will see that in just about every category that there were significant negative effects on South Burlington," Greco says. Those categories include noise, air quality, safety, land use, socio-economics and transportation. The Air Force concedes the F-35s would negatively shape all of those environmental concerns. Advocates of the F-35s say the jets would ensure the Air Guard’s future, but Greco argues supporting the F-35 program in order to prevent the Air Guard Base from closing is both inappropriate and irresponsible. "Other guard bases get other missions when the weapon system they’re supporting retires. 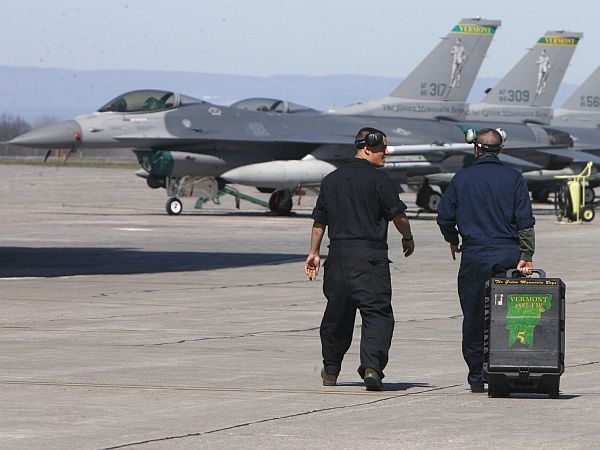 I would hope that if the F-16 is mothballed and the mission goes away that the Air National Guard would get another mission," Greco says. "My primary responsibility is to the residents of South Burlington." On the other side of the airport, in Winooski, city officials have passed a resolution that neither opposes the F-35 program nor supports it. Mayor Michael O’Brien says his city’s resolution recognizes the importance of the Air Guard to Chittenden County’s economy. "It stops short of making a statement either way because we have a lot of questions that we need to answer," says O’Brien. Topping the list of questions is whether higher noise levels produced by the jets would reach into residential areas of Winooski, O’Brien says. "If Burlington is selected as the base for the F-35s, are there ways to mitigate the noise levels? Can we get them down to levels to what we have today or even below that?" Winooski has spent more than $175 million to revitalize its downtown over the past 10 years. The Air Force says noise from the F35s would be heard over a wider area, so the city wants to know what kind of impact that would have on quality of life and property value, especially for low-income and minority families. "For the mission, we think this is going to be the best place," says Ann Stefanek, a spokesperson for the Air Force, which is gathering public concerns. "All of these comments are taken into consideration by the decision maker and will be weighed in their entirety." The Air Force says it is concerned how its mission affects the environment, but, for now, Burlington International remains the preferred location based on its capacity and the cost.